Last week we talked about what makes a good Travel Photograph. This week, I am talking about what makes a good Vacation Photograph. It will not surprise you to hear they both are very much a like. You want them to tell a story and to give a sense of place or where you were on vacation. The added element are people and, specifically, members of your traveling party. For my examples, I will be using my own family. 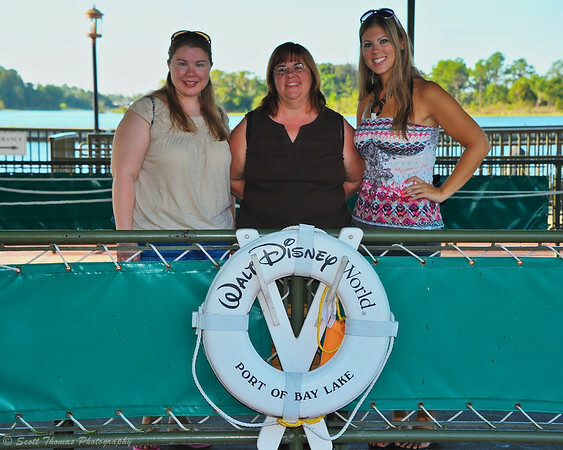 Here you see my wife and daughters at the Port of Bay Lake in front of the Magic Kingdom. While we were waiting to board a Motor Cruiser to Fort Wilderness for a meal at the Trail’s End restaurant, I spotted this nice photo location. The story is nautical and it sure does tell the viewer we were at Walt Disney World. Members of Scott’s family getting ready to board a Motor Cruiser to Fort Wilderness. Nikon D700/28-300VR, 1/200s, f/7.1, ISO 200, EV +0.3, 65mm focal length. Look for ways to connect a person’s history or interests in your vacation photos. My daughter meet up with her high school French teacher at Epcot during this trip. I thought it appropriate to have them pose with Epcot’s France pavilion behind them. 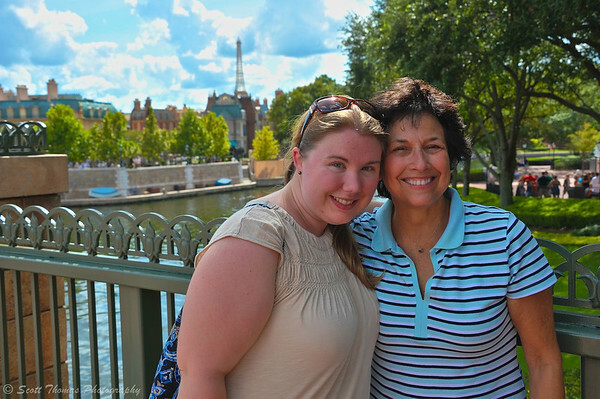 Scott’s daughter and her French teacher with Epcot’s France pavilion. Nikon D700/28-300VR, 1/320s, f/9, ISO 200, EV 0, 40mm focal length. 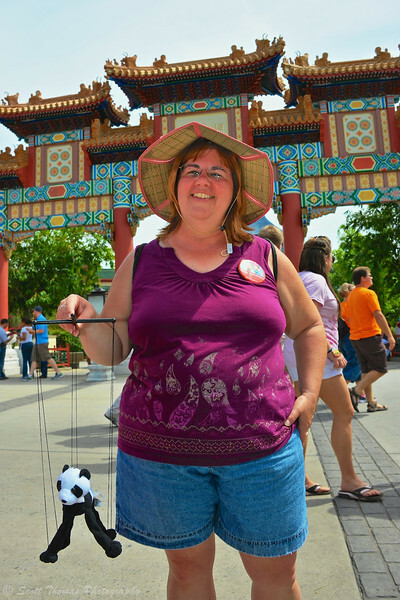 Scott’s wife at Epcot’s China pavilion with a panda puppet. Nikon D700/28-300VR, 1/320s, f/10, ISO 200, EV 0, 28mm focal length. Be creative and have fun on photographing your vacation whether it is at a Disney park or anywhere else in the world. TIP: All of these photos were taken using Fill Flash to cut down the harsh shadows and to brighten the subjects. This entry was posted in Photography, Travel and tagged 28-300mm, bay lake, china, daughters, epcot, family, florida, france, girls, magic kingdom, nikon D700, orlando, vacation, vr, walt disney world, wife, women, world showcase. Bookmark the permalink. The picture of your wife isn’t embarrassing – its cute! I wish my family was so willing to have vacation photos taken. Most of the time I have to be “stealth photographer”! I think it’s cute, too. Look for something “cool” your family wants to be seen with or share with their friends. When they are engaged with something, snap away! Thanks, Nye! Disney parks are full of fun props to use for photographs.